“Nants ingonyama bagithi baba, Sithui (uhm) ingonyama,” opens “The Lion King’s” (TLK) “Circle of Life” in Zulu. Said another way, “it is the lion’s way; the lion is winning; it’s a victory.” That familiar first note tells you you’re in the right, familiar place. The mysterious, haunting melody opening the first act welcomes hordes of colossal elephants, towering giraffes, chattering baboons, hornbills, wildebeest, zebras, lions, “laughing” hyenas, gazelles, and other animals indigenous to the African jungles as they enter majestically down the aisles to the stage of the Music Hall at Fair Park. Tony award-winning “The Lion King” will run at Dallas Summer Musicals (DSM) through Sunday, July 8. A visual wonder, this is a welcome fourth return to DSM as evidenced by the sellout audiences and the enthusiasm in the community. The must-see production is more of an event than musical theater. The costumes, direction, mask and puppet design, all credited to 1998 Tony and Drama Desk award winning Julie Taymor, are exquisite. Garth Fagan’s choreography must be the most complicated, dimensional dance ever brought to the stage, and together with Elton John and Tim Rice’s award-winning music, TLK includes a score of unmistakable choices to sing crossing the Music Hall parking lot. The imagery, effects, Richard Hudson’s scene design and Donald Holder’s lighting design, are magical. Combined with music, dance and costumes, they capture and transport the audience to a faraway place for a mesmerizing experience. There’s a lot of humor built into the script, all delivered with great timing. When Timon, Simba’s loyal meerkat friend, announces that he can strike a visit to the elephant graveyard off his bucket list, you understand “Hakuna Matata” (“It means no worries”). When the multilingual, feisty little guy utters a Yiddish, “Oy,” (short for “Oy vezmir”) he brings the house down. The hyenas’ laughter is hideous, but also contagious. The animals are in constant motion as they take over the stage. According to Puppet Master Bruce Paul Reik: “It took six months of rehearsal for the giraffes to work with the stilts and learn to balance. The front legs are like crutches and the back are stilts. Each is five-to-six feet tall and has to be adjusted for each dancer.” Every giraffe puppet, all male dancers, ends up standing at about 20-feet tall. “The interaction between the puppets and the audience is special,” Reik added. Ramon Reed, Salahedin Safi and Joziya Jean-Felix switch out performances of young Simba. Following his own Thursday night performance, Reed said, “I like all the dynamics of this show.” He has a bright future with his voice, dance and acting abilities if he chooses that direction. His two colleagues agree they love performing in this show. After the tour, Reed will return to the Broadway production. Two young versions of Nala, 10-year-old Danielle W. Jalade and 9-year-old Gloria Manning, agree about how much they enjoy the tour and their role. Based on their smiles and sunny dispositions, they’re right where they want to be. Ben Lipitz rehearsed for four weeks to learn everything he could to make Pumbaa, the overbearing warthog, larger-than-life. “The first week was learning the script and score, and then layering the staging and choreography all the while building the stamina to wear the Pumbaa puppet,” he said. In addition to having teachers who tour with the production, TLK also has a physical therapist on the road. Carolyn Lawson is founder and CEO of Neurosport & Neuro Tour, who specialize in performing arts medicine. “We see quite a few back issues after just about every performance. This show particularly requires a lot of stamina and a world of physicality,” she said. According to Lawson, there are often injuries serious enough to pull performers out of a production. “The Lion King” tickets are available by calling Ticketmaster at 1-800-745-3000. For information, visit dallassummermusicals.org. 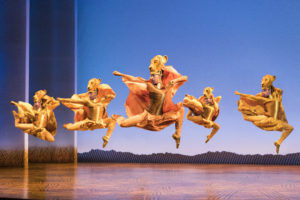 “Lionesses Dance” is one of many exciting production numbers in “The Lion King” at Dallas Summer Musicals through July 8.